CONNOR Benzey is in pole position to earn promotion to the national under-21 circuit. A notorious slow starter at the beginning of the season, the 16-year-old from Eastleigh hit the ground running in the first leg of the EASB Regional Junior Tour South. 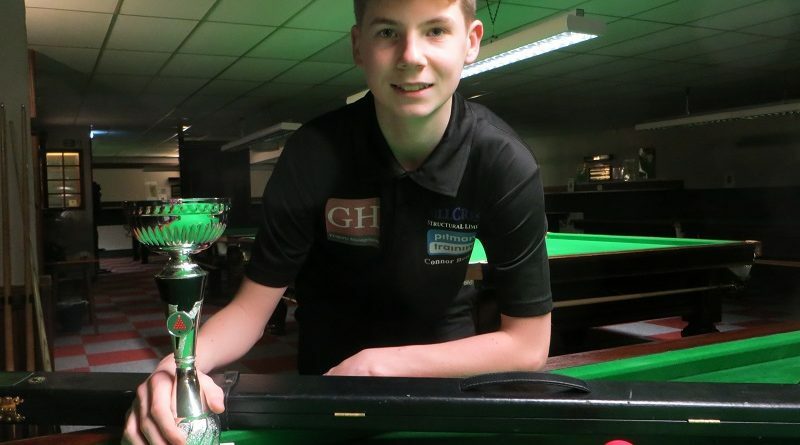 The prolific century breaker, known as The Machine, fired in a 108 in the first frame of a 2-1 victory over Havant teenager Jamie Wilson in the final at Waterlooville Sports Bar. Earlier, in the group stages, Benzey recorded breaks of 73, 71 and 45 as he overcame Riley Ellis (north Wilts) 2-0, Marcos Dayao (London) 2-0 and Wilson 2-1. In fact, the only frames he dropped all day were against the 14-year-old England international. Benzey, who has put in long hours on the practice table over the summer, beat Aristos Pampouris (London) 2-0 in the last-eight and his Chandlers Ford clubmate Ryan Hughes 2-0 in the semi-finals. Subject to official confirmation, the top two in the rankings at the end of the six-leg circuit will earn automatic promotion to the Premier Junior Tour, which is restricted to the top-32 under-21s in the country. A total of 14 of the 18 players compete on the Cuestars circuit and six of them qualified for the knockout. In the quarter-finals, Hughes (Chandler’s Ford) beat Jack Haley (Harlow) 2-1, Steven Hughes (no relation), and also from Chandler’s Ford, lost 2-1 to Wilson and Olly Gibbs (Gosport) overcame Adam Stacey (London) 2-1 before going out 2-0 to Wilson. Players wishing to compete on the Regional Junior Tour must become EASB members and pay the entry fee for each event before a deadline which is usually a week before the event. Details at easb.co.uk. Any problems, email [email protected] He or she is extremely helpful. The next leg is at Chandlers Ford Snooker Club on Sunday, November 25. Then the tour takes in Brighton, Newbury, Fareham and Coulsdon.